Louis pats Harry on the head until he wakes up. Harry groans as he stretches out. He rubs at his eyes and nods. "Of course, love. Just like I promised. Give daddy kisses." Louis smiles and kisses Harry quickly. Harry puts big hero six on and grabs a nappy, lying Louis so he can see the television while he gets his nappy done. "Louis, you haven&apos;t been naughty while having your nappy changed in ages. Don&apos;t start now," Harry scolds. "It&apos;s cold," Louis pouts. Harry smiles softly and promises it will be quick. 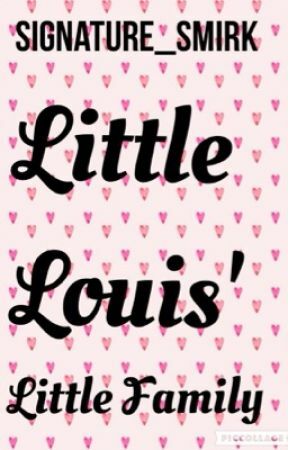 He changes Louis&apos; nappy, kissing his soft tummy before he tugs his pyjamas back over it. "Daddy&apos;s going to make breakfast, love. Okay?" Harry says as he tucks Louis back into bed. "Okay, daddy. Will it be yummy?" "Very," Harry smiles. Louis grins and kisses Harry&apos;s cheek before pushing his dummy back into his mouth. Harry makes Nutella on toast, a warm bottle of milk and some yogurt. Louis waves at Harry as he comes in. "Eat this while your bottle cools down, baby," Harry says. He takes Ted and places him on top of the pillows. "Why can&apos;t Ted sit with me?" Louis pouts. "Because I don&apos;t want you to get food on Ted. Ted wouldn&apos;t like getting all sticky now, would he?" Harry explains. "No. But I can have him when I&apos;m done?" Louis asks hopefully. "Yes, baby. You can cuddle him while you have your bottle." 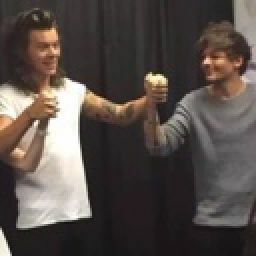 Harry eats a piece of toast and his yogurt, chuckling when Louis beams at him and announces he is finished. "What are we doing today, daddy?" Louis asks, letting Harry wash his hands. "Should we go see Niall and Liam? We can go to their house and maybe go out for dinner?" Harry dresses Louis in black leggings and one of  his big jumpers. Louis beams when Harry calls him beautiful and puckers his lips for a kiss his daddy is more than happy to give. Liam and Niall are happy to see their friends, Niall smiling mischievously as tickles Louis. Louis giggles and gasps for breath, shouting for his daddy and Liam to rescue him. Liam fakes bravery and scoops him up into his arms, kissing his head. "Safe and sound. Away from smelly Niall," Liam grins. Louis laughs at Niall&apos;s expense. Niall pouts. "Well- I was going to make a cake and ask for your help today. But if you think I&apos;m smelly it doesn&apos;t matter," Niall sighs sadly, going to walk away. Louis gasps and jumps down to chase Niall. "I sorry Ni. You not smelly," Louis apologises around his dummy. He wraps his arms around Niall, smiling when Niall picks him up and squeezes him back. "It&apos;s okay, Lou. We can make it later, let&apos;s go make everybody a drink." "Daddy tea?" Louis asks as he toddles into the living room. He was in the kitchen helping Niall make the drinks when Niall asked him to go ask his daddy if he wants a drink, too. Louis clambers into Harry&apos;s lap and plays with his curls. Harry smiles, looking down expectantly at Louis until he makes eye contact. Louis smiles obliviously at Harry, unaware of how fond Harry is right in that moment. "Yes please, princess. Does daddy get kisses?" Harry asks with a smile. Louis kisses his lips gently over and over again until Harry has to remind him to go tell Niall that he wants a drink. "Good boy." "Love daddy," Louis mumbles and kisses him once more. Harry grins and watches Louis waddle quickly towards the kitchen. Liam chuckles. "When are we going suit shopping? Louis told Niall but you know what he&apos;s like, I don&apos;t know if it&apos;s the right day." "We&apos;re getting your two and Ernest&apos;s in a week. Me and Lou are going to shop at around and wait a while to get ours," Harry answers. Liam nods and puts it in his calendar.